Uniwatt’s UTE202NPWB is a non-programmable electronic thermostat with a power of up to 2000W. It can be used to control electric heaters, baseboards or other heating units including those that are equipped with a fan. 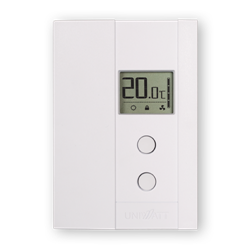 It has two buttons for ease of operation and a large number display that can be set to either Celsius or Fahrenheit. It uses a 2-wire connection and has an accuracy of ± 0.1 °C (0.18 °F).